Drawing from W.E.B. 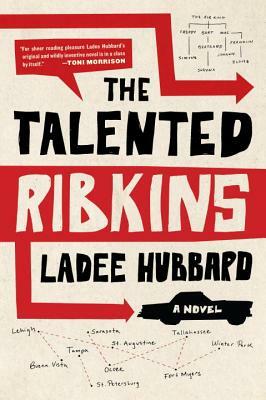 DuBois’s concept of the Talented Tenth, Hubbard’s debut award-winning The Talented Ribkins follows the journey of a family with special powers that were used to advance the civil rights movement as well as for personal desires and greed. Each member of the family exhibits powers which have allowed them to survive as Blacks in America. Johnny, the 72 year old narrator, draws maps that signal specific places where targeted actions during the Civil Movement will have a specific impact. Franklin, his brother can scale high rise buildings, Eloise, Johnny’s niece, can catch things. Andre, his nephew can see in the dark; Bertram, his cousin can spit firecrackers and Barton, his uncle can mimic any voice. The original Ribkin, his grandfather, survives a fire and builds a franchise of a special barbecue sauce. Told through the eyes of the elder Johnny Ribkin, one of the members of the Justice Committee (circa 1965) who were formed to support those involved in the Civil Rights Movement, we witness his struggle to survive to pay a debt by locating money he has hidden over the years. Along the way, he experiences a series of flashbacks which cause him to question the underlying intentions of those who have requested favors from him as well as those who are demanding money from him. Johnny has been a map maker, a teacher, a thief, and a nurturer and protector of his family. Readers also witness the emotional and behavioral changes of other members of the Ribkin family as they face varying obstacles. Set in the south and using the literary elements of speculative fiction, Hubbard keeps readers riveted as they uncover the vulnerabilities, frailties and conflicts of the talented Ribkins. The concept of the maps brings to mind the tracks of the “underground railroad” in Colson Whitehead’s liberation narrative, The Underground Railroad. Just as the railroad provides a roadmap for those escaping enslavement, the maps provide a roadmap for those navigating the treacherous waters of a Jim Crow south. Speculative fiction allows one to create scenarios where Black characters are endowed with unique and powerful talents which are often grounded in a quest for Black liberation. Hubbard has written a captivating and award-winning novel that combines race, politics and class and contributed another text to the genre of Black speculative fiction. Ladee Hubbard is the author of The Talented Ribkins which received the 2017 Ernest J. Gaines Award for Literary Excellence. Her writing has appeared in Guernica, The Times Literary Supplement, Arkansas International, Copper Nickel, Callaloo and other publications. Read Melville House’s description of The Talented Ribkins.